BEAM citizens, bring out your evidence! You only have to look at the healthy dialogue we have on LinkedIn, and the numerous webinars we host, to see that we have strong values when it comes to sharing information and learning together. We want information about market systems development projects to be widely available in the market systems community of practice. Not only this, but we also want to make information accessible to other development practitioners, and hopefully encourage others to adopt these practices. We want to know who benefited—producers and/or traders? The very poor and/or the not-so-poor? Men and/or women? I am a big advocate of learning from failure, and we know that failure in market systems projects is a natural part of experimentation and piloting. To not document these results as well as results of successful interventions would be a mistake. But again, because of complex systems, what didn’t work in one context, might work in another – so we need the same sort of nuanced information as for point no. 2. We know no evidence is perfect, but most evidence has value! This is a point that came out in Elise Wach’s recent BEAM Think piece on evidence. In essence, we do want good quality evidence, but it doesn’t have to be from a Randomized Control Trial. We are not prescriptive about your research design or data collection methods. It is important to be reflective as a community on what kind of evidence we can feasibly produce, that still brings value, and what shortcomings we still have to overcome when producing evidence. So now you have heard our reasons, over to you! 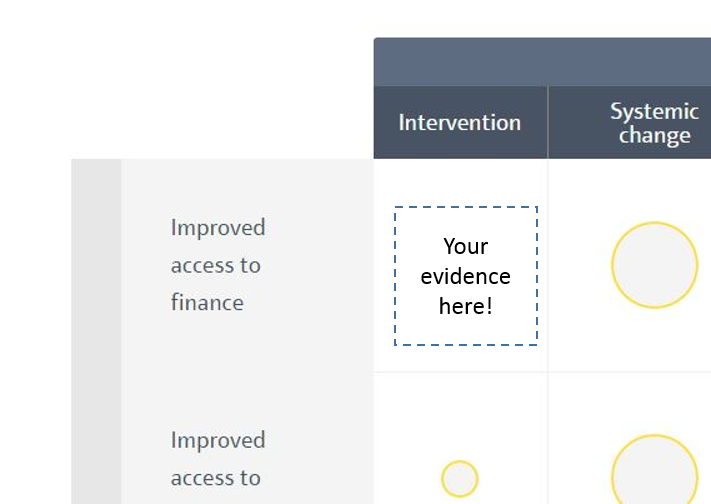 Dig deep into the subfolders of your PC, and think ‘What evidence from my work can I share with the world?’ Take a look at our Evidence map, and ask yourself – ‘What evidence do I have that can fill that empty looking square?’ Please ‘Adopt a quadrant’ of the BEAM evidence map!